In addition this clever device has a manual gain adjustment to enable the detection of the smallest signals and an adjustable "detect off delay" so gaps between songs do not cause false triggers. The AX-S4 is designed to connect to the IR out of an Axium AX-R4 router. This connection allows "flag" status setting in macros for accurate source or system status in an Axium system. The IR port that is used on the AX-R4 router is provided as an output on the AX-S4. 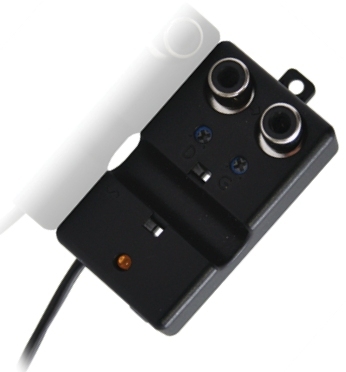 The Sensor directly interfaces with the Axium R4 Router, providing a Boolean contact state i.e. On / Off or Present / Absent status. The IR/Sensor port on the R4 Router is conveyed through the Sensor to an IR output port. The Sensor has adjustments for ‘Off’ Delay, and Gain or Sensitivity. When an input threshold is exceeded the Sensor output is set to a low resistance or 0V. The ‘Detect’ LED is illuminated when the output is set low. The output remains low until the sensed input reduces below the thresholds hysteresis plus the preset time delay, after which the output is set to high resistance (>1M8) or open circuit. Standalone connection to 3rd party systems is made available by following the pin outs in the instruction sheet provided. See a video on the Axium range and it’s applications.